Last night I tried to teach my mom (love you!) how to download a song onto her iPod. It was a nightmare. Not just because I had to explain the concept of an iPod (and of downloading–at least music she understood), but also because of her fear and self-doubt that came along with it. Because I am a professional blogger, I teach people and companies about the Internet, technology and social networking all the time. 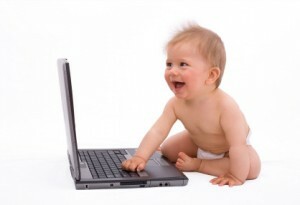 I have come to realize that sometimes grown-ups are virtual kids and kids are virtual grown-ups. They treat going online like learnign to ride a bike. Learning to Facebook is like learning to ride a bike. If you learn it as a child, you are fearless, you try everything, it comes naturally and you have time to practice. If you learn as an adult (I am still trying to learn how to ride a bike so I know), it can be scary. You think about how much it would hurt to fall, you don’t practice as much, you feel awkward, you cannot ride as fast, and, even when you get going, you still feel nervous. Kids go through this process early online, and some are virtually grown-up by age 12! They get over their fear of the Internet more quickly. Learning to manage your fear and insecurities comes with adulthood. These don’t go away, but you can learn to control them or at least mask them. Plus, adult fears are generally rooted in actions with consequences like not paying your mortgage, and not on the bogie man. Online, kids are not nearly as afraid as some adults, though they need some fear to stay safe. Many adults I teach are afraid of pushing the wrong button, feeling “stupid” and “pathetic” if they can’t perform a task correctly. Adults who are virtual kids have more fear and kids who are virtual grown-ups are secure with their online selves. They master virtual adolescence. Like real world adolescence, there is an online teenagerdom too. In this phase, virtual people new to the Internet (kids and adults) have learned the ropes but are kind of awkward online. They still have to take paper notes on how to get to websites, they accidentally click on banner ads and they rarely find what they’re looking for in Google…not yet. It takes time to mature to a virtual grown-up, but some people never make it. The weird thing is, kids always do, but adults sometimes don’t virtually grow up. They don’t act like iPeter Pans I call grown-ups who never virtually grow up — those who are uncomfortable online no matter how much practice and how many lessons — iPeters, because they are stuck in virtual adolescence. They often make risky mistakes. (Please do not open an attachment from the billionaire in South Africa!) But I believe you can grow up online even if you are a grown-up. If you are an iPeter, it takes time, just like learning to ride a bike as an adult. The most important part about growing up virtually is getting over your fear of the Internet. You need to learn that it’s okay to play around with web site buttons (but notbanner ads or spammy attachments). Understand that the Internet works for you, not the other way around. Build your virtual confidence on websites where you feel most comfortable. Talk to teenagers and kids who are confident online to learn more quickly, and be gentle with yourself…being virtually grown-up takes time.